"Now commences the era of our quiet enjoyment of those liberties which our fathers purchased with the toil of their whole lives, their treasure, their blood." These words were delivered by an American clergyman to welcome the victorious end of a lengthy war—not the American Revolution in 1781, but the French and Indian War in 1763. Americans cheered the British victory over France as a joint accomplishment that affirmed their security as British citizens with all the rights and privileges therein. But just twelve years later another American clergyman intoned, "We have no choice left to us but to submit to absolute slavery and despotism, or as freemen to stand in our own defense and endeavor a noble resistance. "* What happened? What ended the "era of our quiet enjoyment of our liberties"? Why did many Americans turn from loyal British subjects to rebellious Patriots in such a short time? We follow the tumultuous process in this theme, Crisis. *1763 sermon: Rev. Thomas Barnard, First Church of Salem, Salem, Massachusetts, 25 May 1763. 1775 sermon: Rev. David Jones, Defensive War in a Just Cause Sinless, sermon, Great Valley Baptist Church, Tredyffryn, Pennsylvania, 20 July 1775. 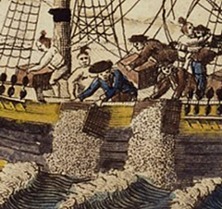 Image: Americans Throwing the Cargoes of the Tea Ships into the River, at Boston, engraving (detail), in W. D. Rev. Mr. Cooper, The History of North America (London: E. Newbery, 1789). Library of Congress, Prints & Photographs Division, LC-USZC4-538 (also Rare Book and Special Collections Division, Digital ID us0012_01). Courtesy of the Library of Congress.